I was making Lemoncello for Recipes to Rival which required me to use the zest on a bunch of lemons but not the rest. What to do with all those lemons? I looked in my preserving books & this recipe for Spiced Honey caught my attention. The combination of lemon, cinnamon & cloves with honey sounded so good to me. It seems like it would be perfect in tea or on a hot biscuit. Insert the cloves into the lemon slices. In a large enamel or stainless steel saucepan combine the lemons, cinnamon & honey. Bring to a gentle boil over medium-high heat. Let boil for 2 minutes. 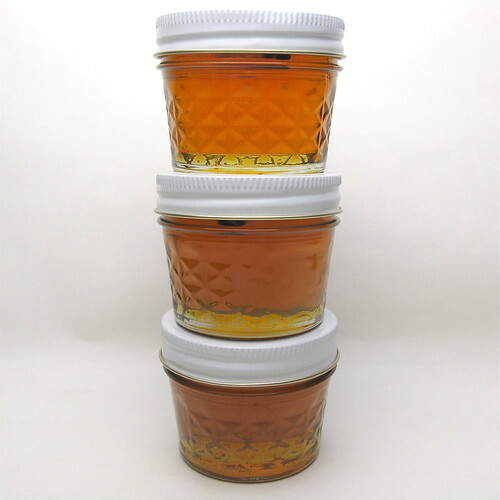 Place 2 lemon slices & on cinnamon stick into each jar of three hot sterilized half-pint jars. Add the hot honey leaving about 1/4-inch headroom. (I left the lemons out of my jars since they didn't look as nice with the zest gone. Also since I used six 1/2-cup jars instead of 3 half pint jars I cut the cinnamon sticks in half to put them in the jars.) Clean off the tops of the jars & cover with a lid. Close with a neckband & finger-tighten. Process in boiling water for 10 minutes. Turn off heat & let sit for 5 minutes. Remove jars from the water to a heat-proof surface & let cool for 12 - 24 hours (do not dry jars). Check to make sure the top of the jar has been drawn downwards, creating a seal. If it hasn't either reprocess that jar or store it in the fridge to be eaten within 3 weeks. Remove the neckbands & store jam in a cool dark place. This sounds amazing! I love all kinds of honey spreads. Aside from honey butter I'd never thought of trying to create them myself. I am more shocked you are not raising bees for honey. Great idea and honey is one of those things I have a ton of but mostly just use in cooking not so much consuming. This is great! It sounds so delicious and doable for a novice (and nervous) canner like me. Question: is the lemon sliced in wedges or rounds? I'm going to show this to my MIL - we may just end up having a weekend canning fest! I love honey! What a great idea....and a great Christmas Gift too! Oh, I would definitely want this on a steaming hot biscuit. My tummy is grumbling. Ooh I love this combination of flavors! Yum! Gorgeous! And how good would this be when you're feeling under the weather? Nice one--I've never thought of this! I've never thought to flavor my honey like this. I bet it's great on homemade bread!